Alice in Wonderland is a 1951 American animated feature produced by Walt Disney and based on Lewis Carroll's Alice's Adventures in Wonderland and Through the Looking-Glass. Thirteenth in the Walt Disney Animated Classics series, the film was released in New York City and London on July 26, 1951 by RKO Pictures. The film features the voices of Kathryn Beaumont as Alice (also voice of Wendy Darling in the later Disney feature film, Peter Pan) and Ed Wynn as the Mad Hatter. Made under the supervision of Walt Disney himself, this film and its animation are often regarded as some of the finest work in Disney studio history, despite the lackluster, even hostile, reviews it originally received, especially in the United Kingdom. The history of Walt Disney's association with Lewis Carroll's Alice books (Alice in Wonderland, Through the Looking Glass) stretches all the way back to 1923, when Disney was still a twenty-one year old filmmaker trying to make a name for himself in Kansas City. When his first series of short cartoons, the Newman Laugh-O-Grams, failed to recoup production costs, the struggling young producer tried to create other short films hoping that one of them would point the way forward. 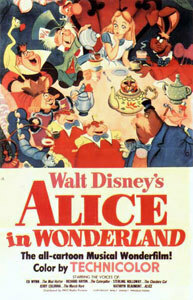 The last of these Kansas City works was called Alice's Wonderland, featuring a live action girl (Virginia Davis) interacting with cartoon characters. While charming, the short failed to receive much notice, and so Walt Disney decided to abandon producing animated films, and left Kansas City to become a live-action film director in Hollywood.